Gentleman’s Agreement (1947): Dir. Elia Kazan. Written by: Moss Hart, with contributions by Kazan. Based upon the novel of the same name by Laura Z. Hobson. Starring: Gregory Peck, Dorothy McGuire, John Garfield, Celeste Holm, and Anne Revere. Unrated. Running time: 118 minutes. Made at a time when discrimination was rearing its ugly head on the national political scene, Elia Kazan’s film details the work of fictional journalist Phil Green. Tasked with writing a story about anti-Semitism, Green chooses an interesting angle: he’ll pretend to be Jewish so he can chronicle prejudice firsthand. His choice has ramifications which expose the ugliness behind supposed American equality. Certainly a premise like this risks becoming pedantic. And while the film does occasionally fall into this trap, you couldn’t get a better man to preach than Gregory Peck. Renowned for his stentorian voice and authoritative air, Peck also has a remarkable chemistry with his co-stars, even as his sheer presence dominates many scenes. Moreover, his co-stars don’t act like generic archetypes as in other social-issue films of the period. Green has key scenes with his mother and his fiancée which reveal them all as characters with unique personalities. Always on the look-out for films about contemporary issues, the Academy might have chosen this film more for its subject matter than its execution. But that doesn’t change the fact that it’s still executed with skill and sincerity by director Kazan. And the film isn’t so much about anti-Semitism as it is about discrimination of all kinds. It plays with the arbitrariness of labels we’re keen to use even today. And rather than resort to portrayals of overt discrimination, the film instead exposes the discrimination boiling beneath the surface. A key scene where Green attempts to ask a hotel if they are “restricted” never yields a straight answer, suggesting that the more abstract forms of discrimination are the most dangerous. 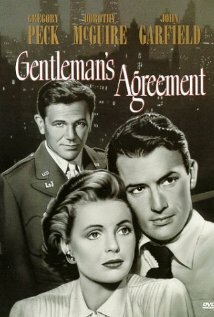 While perhaps not as groundbreaking today, Gentleman’s Agreement nonetheless reminds us about the danger off latent discrimination, and does so without feeling too much like an educational film. I find that admirable indeed.